Rexton, New Brunswick – As the stand-off along highway 134 continues, RCMP negotiators Marc Robichaud and Denise Vautour today asked the anti-shale gas activists who have blockaded and surrounded an Irving-owned compound by what authority they had blocked the highway, and in fact what they were doing there. 'We are here for the water: To protect it and the Earth. 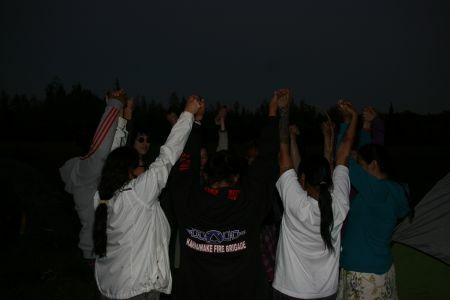 We have been placed here on Turtle Island by our Creator, and we were granted Sacred Responsibilities by our Creator. Our Rights are International, and protected by the Charter of Rights and Freedoms and the Canadian Constitution. Our Inherited Authority and Sovereignty.